Nine members of staff at a leading global media agency will jump out of a plane on Saturday, September 17, to raise money for Yorkshire Cancer Research. 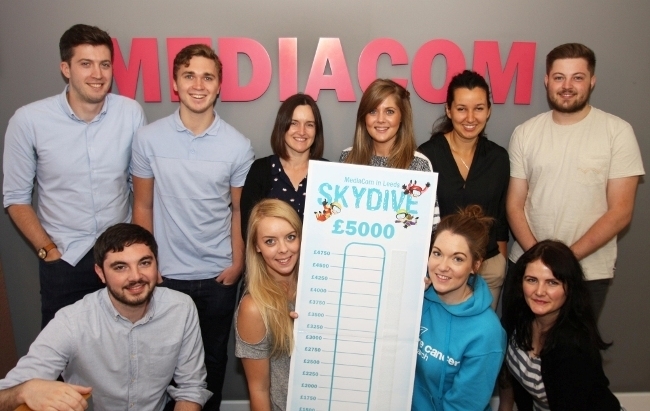 The MediaCom in Leeds team will take to the skies for a 15,000ft skydive as part of a year of fundraising for the charity, which aims to improve cancer outcomes in the region by tackling local cancer problems and priorities. The agency has already raised £1,600 towards its £5,000 target, and staff have planned a range of activities including a charity golf day and a car boot sale. Simon Price, managing director at MediaCom in Leeds, said: “There is a real buzz in the office about our upcoming skydive, as well as the other fundraising activities we have planned to support Yorkshire Cancer Research. Stephanie Jones, regional fundraiser for West Yorkshire at Yorkshire Cancer Research, said: “We’re really excited to have the support of the MediaCom in Leeds team this year. They’ve thrown themselves into the challenge and have started their fundraising at full force. To help MediaCom in Leeds reach their target, please visit www.justgiving.com/MediaCommunity2016. For more information about corporate partnerships with Yorkshire Cancer Research, please visit www.ycr.org.uk/partnerships.